With advancements in dental technology in Lewisville, we’re working to make dental visits more comfortable and relaxing for each one of our patients. If you ask dental patients in the Coppell, Valley Ranch, and Flower Mound area what they hate the most about dental visits, chances are that they’ll mention the drill. Just the sound of it can be enough to make patients feel nervous. Many residents of Lewisville, Texas may wonder if there will ever be an alternative to the dreaded dental drill. Guess what? Now there is! 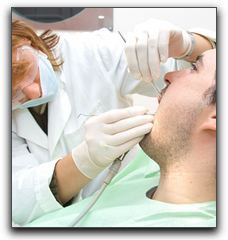 Drill-less dentistry is also known as air abrasion or microabrasion. Air abrasion can be used for common dental procedures such as removing tooth decay or preparing tooth surfaces for sealants or bonding. These instruments work like a little sandblaster that aim a fine stream of particles at the area that would normally be drilled. After the stream of particles strikes and removes the decay, the materials are suctioned out of the mouth. Every day new techniques are coming out, further changing the treatments we give our patients. For the latest in Dental Technology in Lewisville, come visit The Lewisville Dentist. We strive to offer our patients proven techniques that maximize their experience when they visit us. At The Lewisville Dentist, we want our patients to be aware of the latest dental technology in Lewisville, especially as it pertains to general and cosmetic dentistry. If you are in need of quality dental care in the Dallas area, or if you are interested in a smile makeover, give The Lewisville Dentist a call at 214-488-5505. We can answer any questions you have about teeth whitening, veneers, or dental implants. Make your appointment today so your teeth can look and feel their best!